This year marks the 50th anniversary of the 1964 World’s Fair in New York City. Not unlike the modern Olympics, the Fair didn’t turn a profit, but it hosted months of culturally significant spectacles. The Ford Mustang was introduced, Walt Disney launched the It’s a Small World ride, Andy Warhol mocked politicians with some controversial pop art, civil rights activists staged protests blocking highway ramps, the Beatles played in Shea Shadium, and Bob Dylan infamously used an amp. Like the New York’s first World’s Fair in 1939, this was the brainchild of infamous urban planner Robert Moses. (Cue chorus of boos from historic preservation fans.) Fading from political power towards the end of his career, he hoped hosting another World’s Fair and turning Queens garbage dumps into the Flushing Meadows fairgrounds and park would cement his legacy. Even though Moses left a legacy of cruel historic demolitions, I’ll admit Flushing Meadows is a great park. Some of the fair buildings are still open as museums. The ’64 Fair also gave Queens the amazingly topographic Unisphere, which has become an icon of the borough. It’s a great example of space age public art that can belong to everyone, not unlike my old friend the St. Louis arch. Plus, you can buy the world a Coke and keep it company while you’re there. For Catholics, the ’64 fair has special significance because it brought the United States its first papal visit ever. We have Robert Moses’ ambition to thank for it. The Vatican had a pavilion at the Fair, and even shipped over Michaelangelo’s Pieta to display there. Moses hoped his friend Cardinal Spellman could convince the Pope to stop by in a clutch PR move for the World’s Fair. Vatican Pavilion at Flushing Meadows. Collection of the NYPL. And so on October 5, 1965, Pope Paul VI became the first pope to set foot on American soil. He spent only fourteen hours in NYC, establishing the usual cathedral-stadium-political arena template for future papal visits. After landing at the new JFK Airport in Queens, he spent most of his time in Manhattan at a mixture of modern and old-school locations. He visited St. Patrick’s Cathedral and met with President Johnson at the Waldorf Astoria hotel. The Holy Father also addressed the United Nations, warning that “Politics do not suffice to sustain a durable peace.” Later he said Mass at Yankee Stadium, not Moses’ brainchild Shea Stadium (ooh burn! ).Finally, on his way out of town, Paul VI did stop at the Flushing Meadows fairgrounds. Today a marble bench marks where he stood. Pope Paul VI’s whirlwind tour wasn’t as substantial as later papal visits, but it was surely a landmark moment for American Catholics. Only a few years before, John F.Kennedy had become the first Catholic president and a beloved political figure. Seeing the Church’s leader welcomed as an international dignitary must have cemented the fact that “papists’ had been accepted as true Americans, not a dangerous superstitious group swearing loyalty to a foreign power. Also, American Catholicism was no longer just mission territory; it was a major wing of the Church garnering Vatican attention! Eleven years later Paul VI would canonize New Yorker Elizabeth Ann Seton as the first American-born saint, further establishing the United States’ role in Catholic history. Pope Paul VI window in St. Philomena church, Livingston, NJ. I found evidence of this papal euphoria in a parish near me in New Jersey. With its simple yet vaguely colonial style, St. Philomena was probably built in the early 1970s before post-Vatican II modernism had really caught on. 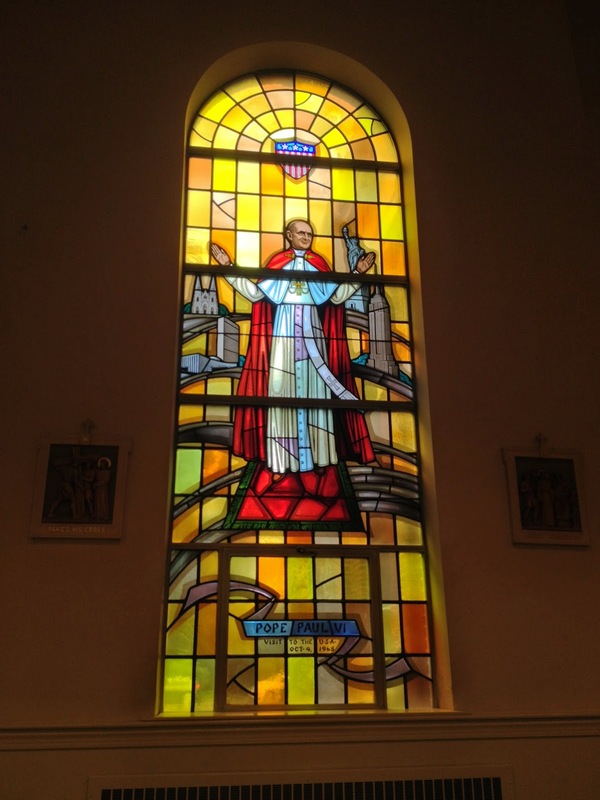 The ample stained glass windows depict mysteries of the rosary, local bishops, and … Pope Paul VI’s NYC visit. The window is amazing and bordering on souvenir-store kitch: Paul VI raises his hands in blessing amidst the Stars and Stripes, St. Patrick’s, the UN, the Empire State Building, and the Statue of Liberty. 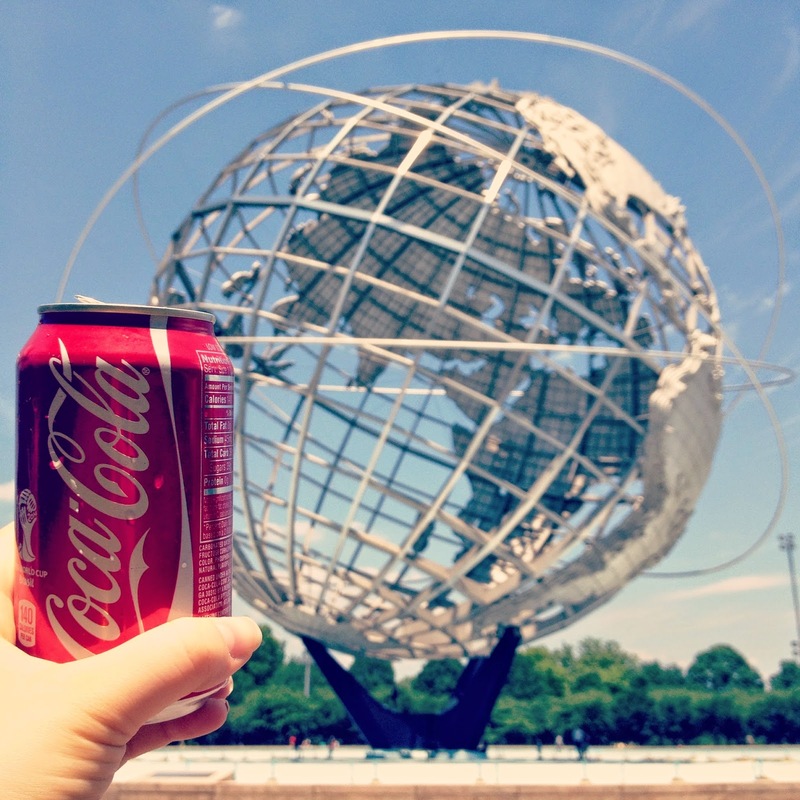 (Sadly, the Unisphere did not make the cut.) A panel at the bottom notes the date of the pontiff’s visit. Perhaps some parishioners fondly remembered attending the Mass in Yankee Stadium and donated the window? I’ll be on the lookout for more Paul VI commemorations in the area. American Catholicism: if it can make it here, it can make it anywhere. If you want to learn more about the 1964 World’s Fair, I highly recommend Joseph Tirella’s new book Tomorrow-Land: The 1964-65 World’s Fair and the Transformation of America, from which I got much of the information in the post. If you find yourself in Grand Central this fall, you should also check out this free exhibit. Summer’s winding down, but I can’t bear to think about long sleeves yet. It’s been too much fun hanging out in the sunshine and taking road trips to new museums. Before we pack away the sundresses and sandals for good, here are some fun images of outdoor festivity that I’ve seen recently. Meanwhile, check out the epic side eye from Clio, the muse of History. “Are you serious girl? I’m over here writing about wars and plagues and fallen empires, and you’re sitting under a billowing canopy? 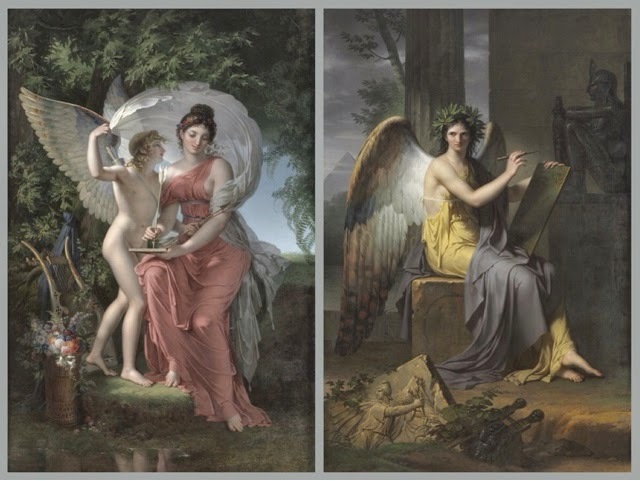 I hope the Persians hit you with a spear.” The two paintings really are displayed like this, with Apollo between them. I’m not exactly sure what the artist Charles Meynier meant here. Clio’s expression is pretty hilarious – but hey wait, is he saying female scholars are all ice cold? Does he think history is just dust and monuments? I do like the suggestion that maxi dresses and serious business can go together, though. Speaking of summer fashions, lest you think flower crowns are a new trend, check out this etching from the print collection of Washington’s Headquarters in Morristown, NJ. George Washington is entering Trenton victorious after crossing the Delaware River to defeat the British. The city’s daughters have turned out for the parade in their best music festival apparel. 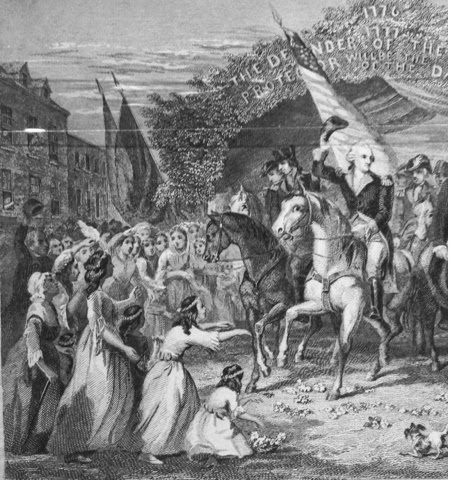 George Washington also spent some time in Brooklyn, although he wasn’t as successful there. 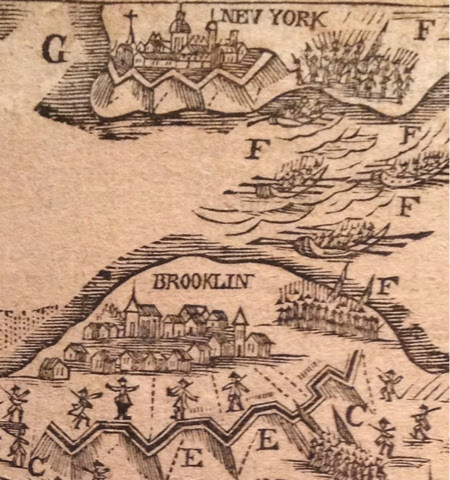 NYC wasn’t quite as built up back in the 1770s, as you can see in this 18th century map from Morristown. I love the little soldiers marching along the palisades. See Charles Meynier, even military history isn’t completely humorless. Adapting a Shakespeare play for a modern setting always runs the risk of veering into hamfisted analogies, but when done with creativity and skill it can make you see the Bard’s timeless language in a new light. 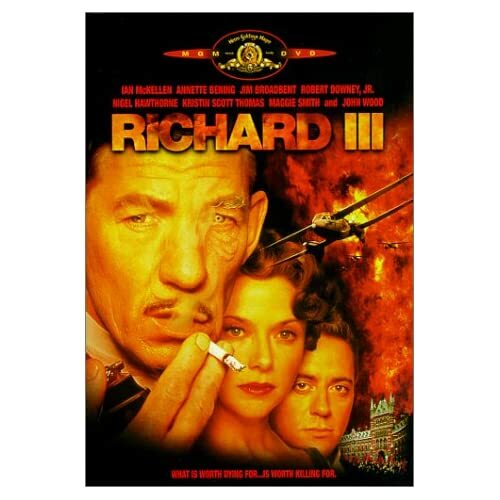 The 1995 film of Richard III starring Ian McKellen is one such example. The 1930s setting provides dazzling, plus it gives Richard’s tyranny a fascist feel. The cast is a stellar collection of British actors, plus pre-Iron Man Robert Downey Jr. for good measure. Even better, it uses several museums and historic houses as filming locations, showcasing their most dramatic aspects. Modernist architecture provides compelling scenery for the political drama. (So compelling, in fact, that the same locations appear in Christopher Nolan’s Dark Knight films.) Most notably, Sir Giles Gilbert Scott’s 1947 Bankside Power Station serves as a streamlined re-imaging of the Tower of London. Today this building is the home of the Tate Modern. It opened to the public in 2000 after major interior renovations; Richard III probably filmed there just before demolitions began. Another Art Deco industrial site, Battersea Power Station, is the site of Richard’s final battle. The power stations’ striking geometry is mimicked by the bold, clean lines of Richard’s office headquarters, which are set in the Senate House of the University College, London. This 1937 Art Deco tower designed by Charles Holden has its own fraught political legacy, since it was the site of the Ministry of Information offices during World War II. George Orwell modeled the appearance of the Ministry of Truth in 1984 after its aesthetic. The building’s bold, direct style is a perfect match for Richard’s single-minded ambition. Modern minimalism is even more compelling in contrast with the ornate style of other settings. The Brighton Pavilion‘s over-the-top orientalism makes some colorful appearances. Look for its music room lotus chandeliers in a shot from King Edward IV’s deathbed. Gothic revival elements fill other royal spaces – some ornate urinals at Horace Walpole’s Strawberry Hill estate even make a showing. These luxurious spaces eventually fade from view, though, as the play shifts toward its belligerent conclusion. The certainty of earlier regimes is a distant memory, and Richard’s power proves precarious. He may get to traverse the battlefield in a jeep, but in the end he’s still left crying out for a horse. Modern power is fraught with unpredictability, and its day in the sun is short before it must give way to the next generation and its innovations. Image sources: Tate Modern, Senate House, Brighton Pavilion. Here’s a collection of some interesting and fun museum-related articles floating about the internet this month. President’s Park in Williamsburg, VA was slated for auction yesterday, proving that The Burg’s love for patriotic kitsch actually has limits. (Remember, this is the town where you can see people in colonial garb buying beer at your local convenience store.) Declining income forced the park to close in September 2010. Visitor reviews offer a glimpse at the tourist oddity that was. No word as to why the sale was cancelled, but a private investor is interested in the property. If you wanted a giant Millard Fillmore head for your lawn, you may have missed out. The Atlantic recently discussed how “Museums Want to Entertain You” with technology. Are smart phones now an inevitable exhibit component? Speaking of exhibitions, the Tate Britain’s upcoming Pre Raphaelites: Victorian Avant Garde looks fantastic. I’m curious to see how many pieces the show borrows from the Delaware Art Museum’s excellent Pre-Raphaelite collections. Even more exciting, the exhibition will travel to Washington D.C.’s National Gallery of Art in 2013. Finally, this piece on linguistic inflation alerted me to the growing use of the word “curate” in non-museum contexts. Now that I think about it, I’ve seen several style bloggers describe themselves as “curators” of accessory collections, etc. What do you think? Are stylists and artists misusing a technical term? Is it helpful or harmful to museums when the general public start calling themselves curators? Should I change the title of this feature, which I meant to be slightly ironic? Personally, I think it’s great if people think about what curators do and how they can relate to it. When I analyze material culture in movies and wedding magazines I’m only half kidding; material culture is a discipline that shed light on people’s lives no matter their century. The one danger is that “curator” becomes an over-saturated pop-culture buzzword. In two years I’ll brace myself for the anti-twee backlash that forgets professional curating requires serious training and scholarship. Happy 100th Birthday, Cherry Blossoms! 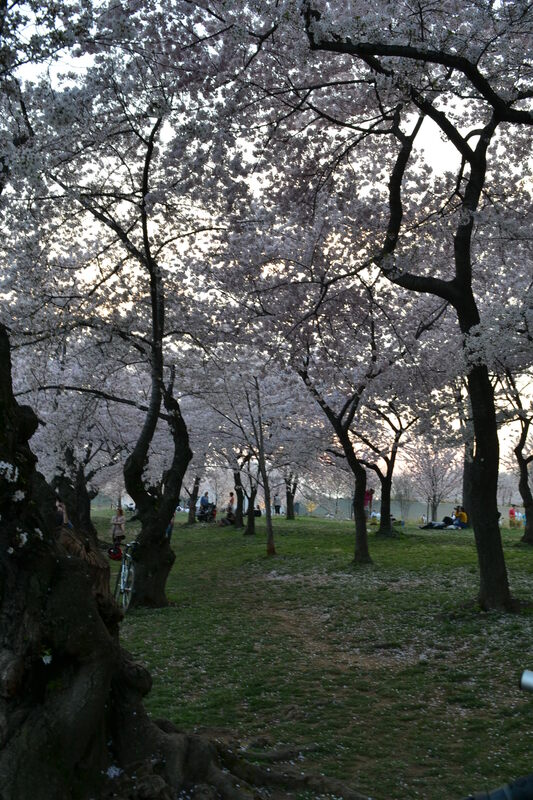 A forest of pink blossoms along the Tidal Basin. This weekend marks the annual Cherry Blossom Festival in Washington, D.C. Alas, the blossoms have come and gone already, but they were so beautiful while they lasted. These fluffy pink trees are such a great urban natural wonder. I’m so glad I made it downtown while they were still at their peak. The MLK Memorial at sunset. 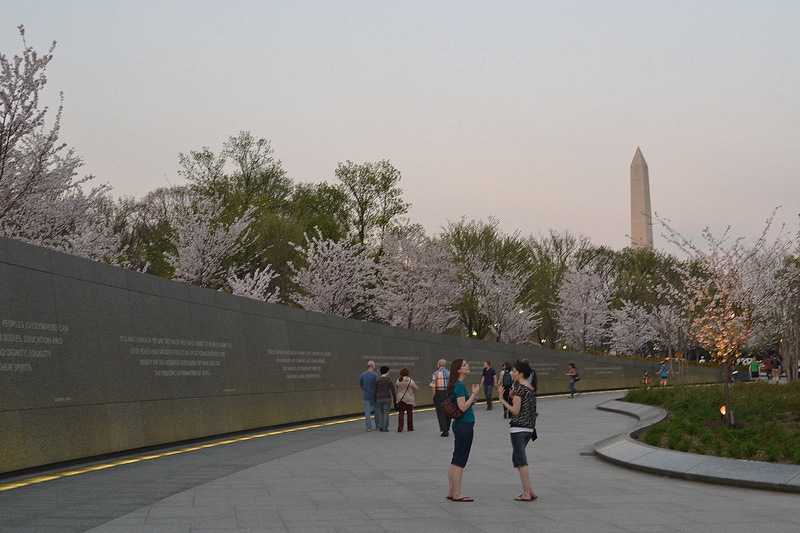 On our cherry blossom adventure, my friends and I met up at the new memorial to Dr. Martin Luther King Jr. The King Memorial is an easy-to-find landmark when approaching the Tidal Basin from the National Mall, and does a good job of ushering visitors into its expansive space. Whereas the FDR Memorial blends into the landscape, you can’t help noticing the massive mountains of stone that form the entrance and statue. Every time I have visited, crowds diverse in age and ethnicity have been streaming into the courtyard. I’m not sure how I feel about the irony of Dr. King’s statue being completely white, but I am amused how he is facing the Jefferson Memorial, glaring at our racially-conflicted 3rd President. My only real criticism of the MLK Memorial is about its logistics. While the courtyard is wide and expansive, the statue is poorly placed. There is plenty of room for visitors to mill about reading the quotations on black granite walls, but only a small area actually offers a view of Dr. King’s face. On a typical afternoon, the crowd is concentrated in a smaller triangle of space. Everyone and their mother/brother/friend/middle school class is packed into about twenty percent of the floor plan, angling for that crucial statue photo-op. This layout leads to crowded conditions that often block the path to the Tidal Basin. Compare this to the Lincoln Memorial, where the 16th President is clearly visible from a variety of angles and distances. Good photos can be taken on the steps or inside the structure itself. This encourages an efficient flow of visitors, rather than a concentrated bottleneck. I hope Frank Gehry is considering such things in his controversial design for the Dwight D. Eisenhower Memorial. Oh dear. In a facepalming example of ignoring historical context, Nike has offended Irish people with a St. Patrick’s Day release of a shoe called the “Black and Tan.” Why don’t you just name one for the Ustasha while you’re at it? Speaking of context, the V&A is using technology to tell the stories of clothes in the new Hollywood Costumes exhibit. Everyday Carry, or EDC, great examples of real-life material culture. Sotheby’s employee Alice Gregory dishes about life in New York’s premier auction house – art, its owners, auction protocol, the clothes, the Sotheby’s girl stereotype, and the Teamsters strike. She reminds me of the time I ate lunch in their cafe, dodging black-clad girls who looked like extras from The Devil Wears Prada. What could a deaf and blind person say about material culture? Quite a lot, as Helen Keller’s reflection on visiting the top of the Empire State building shows. You may have heard how Encyclopedia Britannica will no longer be producing print editions, thereby joining the planet Pluto and VHS tapes among “Things schoolchildren of the future will have no clue about.” The living room encyclopedia set now seems like a quaint relic of the 20th century. Clearly the internet has made information ubiquitous, not a status symbol. Or are smartphones and tablets the new Brittanica of middle-class aspiration? I hope you have a great weekend with some St. Patrick’s day revelry! If you need ideas, here are the 10 Best Museums to have a party in.